We’ve been supporting Operation Supply Drop since 2014 because we believe in the importance of giving back to Veterans. We don’t want to just do it through donations -- we want to raise awareness about the importance of supporting Veterans and more importantly how anyone can get involved with Operation Supply Drop to do just that. All you need to do to take part is to sign up and become part of our team at xspl.it/8bit. If you've previously participated but is not part of any team yet, we'll be very happy to have you as part of ours. As part of our team you immediately get a Premium license (if you don't have one yet) for the entire duration of the campaign. You also get promotion of your stream through our social media channels. If you're already participating as part of another team or even organizing your own event for #8BitSalute, we still want to hear about it! Hit us up via @xsplit and we'll be happy to take a look at your own endeavor and push it on socials as well. 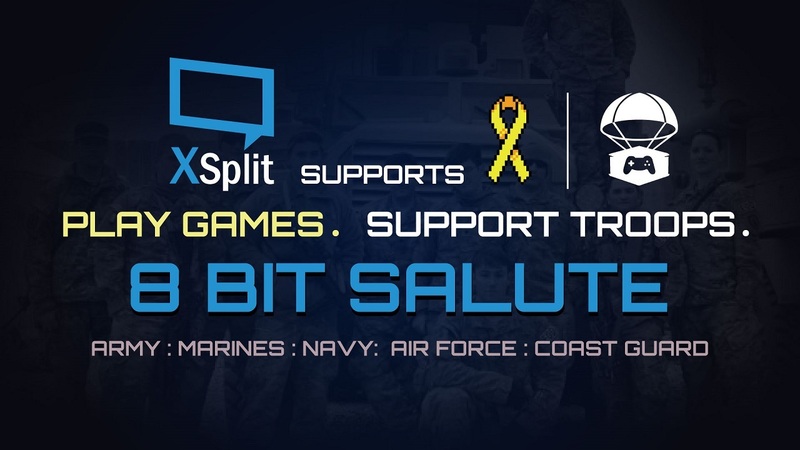 We've partnered with Operation Supply Drop once again so that everyone who raises $20 or more gets a free 3-month XSplit Premium license but it doesn't stop there! Those who raise $50 or more becomes eligible for a drawing where they can win an XSplit Lifetime Premium license and some merch! We hope that gets you excited! Let's all play and stream games to support troops!